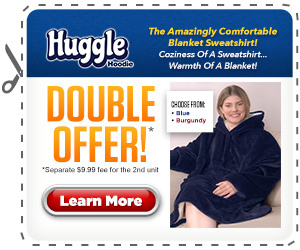 As Seen On TV Huggle Hoodie - The Amazingly Comfortable Blanket Hoodie! Coziness Of A Hoodie... Warmth Of A Blanket! Huggle Hoodie is the amazingly comfortable blanket hoodie that keeps you snug and warm from head to toe! Huggle Hoodie is made of luxurious blanket fabric lined with the ultimate in warming, comfort. This comforting blanket hoodie is both reversible and machine washable. Huggle Hoodie is the oversized ultra comfy hoodie you can wear anywhere. Just slip on Huggle Hoodie and the chill is gone!